CDNIS Equestrian team performs at Inter School Heat. 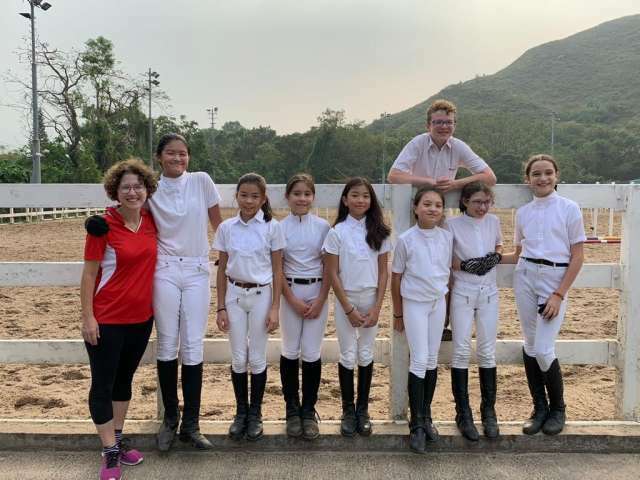 Shout out to our amazing Timberwolves lower division equestrian team! They did our school proud last Friday. The CDNIS Lower Division Equestrian Team had a super successful Inter School Heat. Across both teams, CDNIS won first through sixth place in dressage and first through fourth in jumping – 10 out of a total 12 ribbons. Everyone of our eight riders placed, which is a significant feat since six of the eight riders are competing in their first Inter School. Kellis Yeung won the dressage and Kayla Yeung won the jumping. Kamila Wilson came in second in both, with the highest overall score for CDNIS. With the first heat done, CDNIS team 1 is in first place and CDNIS team 2 is in second place. We now hope our scores are high enough for the Final in May! Congratulations to our riders and their Coach, Rachel!! The CDNIS team consists of: Jem Wilson, Kellis Yeung, Amy Agren, Eva Gunning-Garcia, Anise Walker, Jessica Yu, Kamila Wilson and Kayla Yeung.